Historians of language teaching have documented considerable fluctuation in methodological preferences over the decades (see, e.g., Musumeci, 1997, this volume). Lacking much by way of an empirical base until recently, the field has experienced major swings back and forth in the advocacy of what may be described as “interventionist” approaches, on the one hand, e.g., grammatical syllabuses, grammar translation, and audiolingualism, and “laissez faire” approaches, on the other, e.g., the process syllabus, immersion, and the Natural Approach. In terms of the important distinction made by Wilkins (1976, and elsewhere), the former tend to be synthetic, focusing on the target language itself, presenting small pieces (structures, notions, functions, lexical items, collocations) one at a time, and requiring learners to synthesize them for communication. Analytic approaches do the reverse, starting with the learner, respecting internal learner syllabuses, presenting gestalt samples of the L2, and helping students to analyze the input and induce underlying rules and the meanings and functions of words. Research findings, summarized below, on processes in interlanguage development and on learnability and teachability are inconsistent with synthetic approaches, and consistent with analytic ones, but also suggest that something more than pure implicit learning, specifically, what I call focus on form (Long, 1991, 2000a; Long & Robinson, 1998), makes adult SLA more efficient, and is required if near-native proficiency is the goal. Pendulum swings notwithstanding, and while very different approaches have been advocated on university courses, at conferences, and in the pages of methodology textbooks over the years, observational studies of real lessons, as opposed to one-off demonstrations, have found that what goes on in classrooms has varied less than might have been expected. Brand name “methods” (Grammar- Translation, Direct Method, Audio-Lingual, Audio-Visual, Silent Way, Total Physical Response, Counseling Learning – Community Language Learning, Suggestopedia, Natural Approach, etc.) differ in some respects, but tend to countenance many of the same activities and procedures. On the classroom floor, rather abstract strategic prescriptions and proscriptions take a back seat to the 101 tactical decisions teachers must make as even the slowest-paced lesson unfolds. The results over time tend to look very similar and, it is often noted, uncannily like lessons those teachers themselves experienced as school-aged pupils, a decades-long cyclical pattern captured in the phrase “the persistence of the recitation” (Hoetker & Ahlbrand, 1967). This fundamental commonality could account for the failure of the so-called “comparative methods” studies of the 1960s and 1970s to find sustained differences in student achievement; it is not that what goes on in classrooms does not matter, but that what goes on in classrooms is often rather similar, regardless of the methods labels attached to them. On What Basis Advice, Then? Given the historical record, the wide range of settings and situations in which languages are taught, and the variance in players and learning purposes, it may seem unreasonable, therefore, if not downright arrogant, for anyone to propose universally applicable methodological principles for LT. Are research findings robust enough for the field to be confident about any proposals for LT? Are not second, foreign, and other language settings, or local situations within each, so different as to preclude recommendations that would apply in all contexts? Two considerations are relevant here. First, the fact is, LT is no different from most professions. The state of knowledge in language learning and teaching is developing all the time, just as it is in medicine or engineering; it is just (much) less developed. The responsibility of professionals in any field is not to know the right answer, but to be able to defend recommendations in light of what is thought to be the right answer or the likeliest right answer (best practice), given what is known or thought to be known at the time. What is irresponsible is to throw up one’s hands and declare that no proposals should be made and defended until everything is known for sure (which will never happen), and use that as implicit or explicit justification for whatever proposal follows, or for no proposal, or to recommend that, meanwhile, teachers should use a pinch of this, a dash of that, i.e., the so-called “eclectic method” (an oxymoron). Second, language learning is a cognitive process, albeit one that occurs in a social setting. While some individual differences, e.g., in language aptitude, are important enough, and measurable reliably enough, to warrant differentiated classroom treatment where student numbers and resources permit, the architecture of human brains varies very little among adults or among children (although there are differences across the lifespan as a function of age, of course), and certainly not as a function of where learning and teaching are carried out. The same cognitive architecture and processing options pertain, for example, when a Chinese learner of English boards a plane in the PRC, a foreign language setting, as when he or she disembarks a few hours later in a country where English is spoken, a second language setting. The reasons why students learn English in the PRC or the UK, i.e., needs and goals, may differ, as may attitudes, motivation, and opportunities for L2 exposure on the street, but although what should be taught (L2 varieties, which genres or skills, etc.) will vary, the way learners process linguistic input in each place does not, and so should presumably be targeted by teaching in the same optimal ways in Beijing or Birmingham. In discussions of how to teach second and foreign languages, it is useful to distinguish between methodological principles and pedagogical procedures. While first introduced as part of proposals for Task-Based Language Teaching (TBLT; see, e.g., Doughty & Long, 2003a; Long, 1985, to appear), the distinction is helpful when describing any approach to language teaching. Evaluation criteria are the standards by which proposals can be judged. Methodological principles (MPs) are universally desirable instructional design features, motivated by theory and research findings in SLA, educational psychology, general educational curriculum design, and elsewhere, which show them either to be necessary for SLA or facilitative of it. 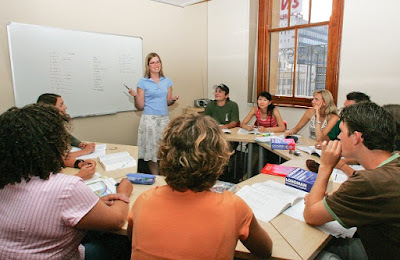 Facilitative effects are important because the goal of a theory of language teaching is a maximally efficient approach, not, as in the case of a theory of SLA, one which is primarily concerned with what is necessary and sufficient for learning to occur (for further discussion, see Long, 2000b, pp. 4–5, 2007a, pp. 16–20). Negative feedback, for example, may or may not turn out to be necessary for language development, but numerous studies have shown it to be facilitative, justifying MP7: “Provide negative feedback” (see below, and Table 21.1). The theoretical and empirical support means that MPs are candidates for any approach to language teaching, task-based or otherwise. Pedagogic procedures (PPs) comprise the potentially infinite range of options for instantiating the principles at the classroom level. MPs specify what should be done; PPs suggest how it can be done. Variation in how is often appropriate for learners of different ages, aptitude, cognitive style, proficiency, or L1 and L2 literacy level, for more salient and less salient target forms, and so on, and is handled at the level of PPs. Given that variations in implementation are designed to respond precisely to particular needs and conditions at the local level, often moment by moment as a lesson unfolds, choices among PPs are usually best left to the classroom teacher, typically the expert on local conditions, and will not be dealt with here. Whereas MPs are founded upon, and can be evaluated against, current theory and research findings, choice among PPs is mostly a matter of teacher judgment, with different choices potentially justified at different times with the same learners or at the same time with different learners. Consequently, choice among the wide range of PPs for providing negative feedback, for example, from the overt and explicit end of the spectrum, such as use of a rule or explanation, to the covert and implicit end, such as corrective recasts, and many points in between, cannot be judged well- or ill-founded without knowing the context. Evaluation criteria (EC) for MPs are the standards by which proposals can be judged, the ways in which their likely validity may be assessed. EC could take many forms, including, most obviously, EC1: “Theoretical motivation,” EC2: “Empirical support,” and EC3: “Logical argumentation.” To illustrate, in the case of MP7: “Provide negative feedback,” EC1 is met by the predictions of theories of or in (S)LA as disparate as Skill Acquisition Theory (DeKeyser, 2001, 2007), Emergentism (N. Ellis, 2007; Larsen-Freeman & Ellis, 2006), Cognitive Interactionism (Gass, 1997; Long, 1996b; Gass & Mackey, 2007), Universal Grammar (White, 1991, 2003), and Sociocultural Theory (Aljaafreh & Lantolf, 1994; Lantolf & Thorne, 2006). EC2 is met by the findings of numerous empirical studies, and meta-analyses of studies, of the positive influence of both implicit and explicit corrective feedback on L2 development (e.g., Long, 2007b; Mackey & Goo, 2007; Russell & Spada, 2006). EC3 is met by arguments such as that of White (1987, 1991) concerning the logical impossibility of unlearning L1 options on the basis of positive evidence alone when the input gives no indication of their impossibility in the L2, a situation that potentially occurs whenever options in the L2 are a subset of those in the L1 in a given domain, e.g., those for adverb placement for L1 speakers of French or Spanish learning L2 English. A major source of evidence for the strength of the learner’s role in SLA, and simultaneously, about the limits of instruction, is work on processes in interlanguage development. Interlanguages (ILs), individual learners’ transitional versions of the L2, are the psycholinguistic equivalent of idiolects. While ILs exhibit systematic and free variation, and no two ILs are exactly alike, studies have shown that they exhibit common patterns and features across differences in learners’ age and L1, acquisition context, and instructional approach. For example, independent of those and other factors, learners pass through well-attested developmental sequences on their way to mastery of target-language structures, or, as is often the case, to an end-state short of mastery ( Johnston, 1985, 1997; Ortega, this volume). Another indication of what Corder (1967, and elsewhere) referred to as the powerful internal “learner syllabus” is the occurrence of common errors and error types in the ILs of learners of different ages and L1 backgrounds, and across formal, informal, and mixed learning contexts. The most often noted of these, perhaps because they are salient and seem easily interpretable as reflecting underlying “hypothesis-testing” learning processes, are morphological errors, such as goed, or sheeps. While striking, such so-called overgeneralization errors are relatively infrequent (perhaps 2 percent of all errors), and just one of four pervasive error types documented in a study of native-Spanish-speaking naturalistic, instructed, and mixed learners of English by Pica (1983). Even when presented with, and drilled in, exclusively target-language forms and structures, and even when errors are routinely “corrected,” instructed learners’ acquisition of a “structure of the day” is rarely either sudden and categorical or complete, as is assumed by most synthetic materials and methodology. On the contrary, while sudden changes in performance suggest occasional fundamental restructuring of the underlying IL grammar (McLaughlin, 1990), acquisition of grammatical structures and sub-systems like negation or relative clause formation is typically gradual, incremental, sometimes taking months or even years to accomplish. Nor is development always target oriented. An increase in error rate may precede, and even be an inevitable precursor of, acquisition of a new rule or constraint, e.g., when learners attempt application of an existing one in a more complex linguistic environment (Meisel et al., 1981). The findings briefly summarized above (a tiny percentage of those produced by SLA researchers in recent years) dispel any notions that learners learn what teachers teach when they teach it, yet whether recognized or not, this is an implicit assumption underlying synthetic approaches to LT. The results are simply incompatible with use of a synthetic syllabus and teaching methodology, the combination I refer to as “focus on forms,” where syllabus content consists of a pre-set list of linguistic (phonological, morphological, syntactic, lexical, or collocational) forms and functions, as opposed to some other area subject matter, such as mathematics, art, or physical education, or from target tasks for the learners concerned. As distinct from one-off uses in demonstration lessons or controlled experiments with simple structures carefully selected for specific groups of learners, a synthetic syllabus and the pedagogic materials that embody it will almost always have been written without reference to students’ present or future communicative needs, as identified via a thorough needs analysis, and so are inefficient. They risk teaching more – skills, vocabulary, genres, etc. – than students can use, but also less, through not teaching language abilities they do or will need. They will also almost always have been prepared in ignorance of any particular group of students’ current developmental stages, especially if enshrined in industrial strength, commercially published textbook materials. Moreover, as any experienced teacher knows, and as shown, e.g., by the Pienemann (1984) study described earlier, learners within a group will often be at different developmental stages, even when labeled as having attained X or Y level of proficiency or having scored within a specified range on a placement test. Learners can achieve roughly similar overall proficiency and test scores despite strengths and weaknesses in different areas of their IL repertoires. MPs such as these, MP 6: “Focus on form, not forms,” and MP7: “Provide negative feedback,” implicitly where this will suffice, are ways in which a wholly analytic approach relying purely on incidental learning (learning language while doing something else) needs to be supplemented. Learning is speeded up that way. Also, certain specifiable problems can be dealt with that may not be treatable at all through provision of positive evidence alone. To take a simple example, White (1987, 1991, and elsewhere) has drawn attention to cases where an L1 and L2 are in a superset – subset relationship in a particular domain. Native speakers of languages like French and Spanish learning English, for instance, can say the equivalent of “I drink coffee every day” and “I drink every day coffee” in their L1, whereas the latter is ungrammatical in English since it violates the constraint against separating verbs and direct objects. Since they will encounter the first in the L2 input, and since their production of either will be readily understood by English speakers, they may never notice that the second is wrong unless someone or something draws their attention to the problem, e.g., by providing some form of negative evidence. MP1: “Use task, not text, as the unit of analysis” MP3: “Elaborate input,” and MP6: “Focus on form” are original to TBLT. Others, e.g., MP2: “Promote learning by doing,” MP7: “Provide negative feedback,” and MP10: “Individualize instruction,” are based on long traditions in philosophy, SLA, psycholinguistics, language teaching, curriculum theory, the history of education, and educational psychology. While originally developed as part of TBLT (see, e.g., Doughty & Long, 2003a; Long, 2000a; Long & Norris, 2000), all but MP1: “Use task, not text, as the unit of analysis,” could, and perhaps already do, operate in some nontask- based analytic approaches, such as “sheltered” instruction, process syllabusbased courses, a few varieties of content-based LT, and some types of bilingual and immersion education. Few approaches embody all ten MPs, however. Contra both MP1 and MP3: “Elaborate input,” for example, much immersion education and most content-based approaches organize instruction around either genuine or simplified texts, not tasks. In addition to the well-documented psycholinguistic problems with both text types (see Long, 1996a, 2007c; Long & Ross, 1993), part of the rationale for MP3 is that the use of static, “found” models of language use, albeit at the supra-sentential level, in the form of texts typically leads to other undesirable classroom behaviors, such as a focus on forms. To conclude, it is worth reiterating that, as in most fields of human activity, the state of knowledge in second and foreign language learning and teaching is developing all the time. Given the history of SLA and other sciences, it is unlikely that the cognitive-interactionist theory of SLA implicit in the MPs and underlying TBLT as a whole will turn out to be correct, although it is to be hoped that at least some parts of it will be. To say that further research is needed is an understatement, however, and the findings may well show that some of the current ten MPs are unfounded, that others require modification, and that new ones need to be formulated. Meanwhile, proposing a theoretically coherent set of MPs, prima facie defensible given what is known or thought to be known about the processes involved, responds to an immediate need; learning and teaching new languages are too important for too many people to do otherwise. Long , Michael H & Catherine J. Doughty. (2009). The Handbook of Language Teaching. UK: Blackwell Publishing Ltd.
0 Response to "Methodological Principles For Language Teaching"